Black Hole 529-0 Dragon & Jontron with Lea Luna - Tonight 1. George Acosta Remix 2. Steve Smooth & Tony Arzadon Remix 3. Shane Halcon Remix 4. 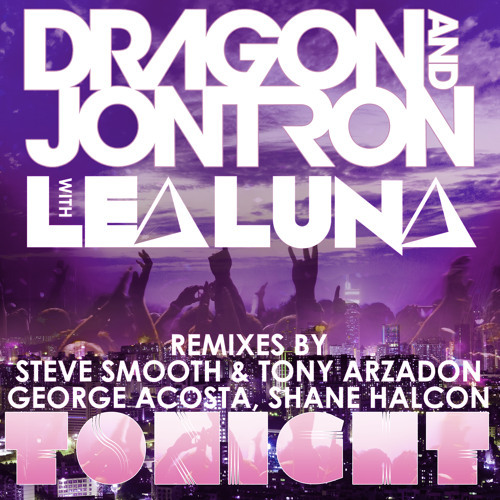 2013 Remaster Dragon & Jontron present a brand new remix package of their hit single “Tonight” on the Black Hole imprint. The vocals are peformed by Lea Luna. Dragon and Jontron teamed up in 2010 and it hasn’t taken them long to make a splash in the dance music world. The two are responsible for prolific remixes for some of the most respected artists in the scene including such heavy weights as Tiesto, Kaskade, BT, Jes, Afrojack, La Roux and many others. As artists they not only made name as prolific producers, but also as professional DJs: both are residents of Beta Nightclub in Denver, the #1 club in North America. Playing a combination of progressive, electro and the special Dragon & Jontron sound, they’ve managed to successfully fuse their talents in the studio and debuted their sound for the Avanti imprint with their first single “Sriracha”. Now the boys bring us their excellent follow up entitled “Tonight”. “Tonight” features the vocals of the great Lea Luna. Electro-house goddess DJ Lea Luna has been on the up-and-up since 1999, rocking many a crowd from underground to commercial, across the US and abroad. Her white-hot enthusiasm on stage and in the studio reflects her 9 year career, which has been gaining exponential momentum since she first stepped up to the decks as a tiny teen. Lea Luna recently performed on the Manufactured Superstars hit single "Drunk Text". Dragon and Jontron delivered a massive party track with “Tonight” last year. Creating the perfect balance between tightly produced house with a hint of tech trance and driving sweeps, the two producers laid a powerful landing strip for Lea Luna’s enticing vocals and rocked dance floors all across the world. The massive remixes from George Acosta, Steve Smooth & Tony Arzadon and Shane Halcon have prepared “Tonight” for this upcoming season’s events and festivals; DJs beware for this bomb shell smash!